A homemade mayonnaise prepared with free range eggs, extra virgin olive oil, and fresh herbs is delicious and nutritious. For the Herb Mayonnaise: In a stainless steel or ceramic bowl, beat the egg yolk with a wire whisk. Add the mustard, salt, vinegar, and lemon juice, and mix until well blended. Add the oil by pouring in a slow steady stream and beating continuously. If the sauce becomes too thick, thin it out with 1/4 teaspoon water. Add the white pepper and taste for seasoning. Put the parsley and watercress in a piece of cheesecloth, twist the ends together to close, and squeeze the juice from the herbs into the mayonnaise. Add the remaining ingredients, including the watercress and parsley. Blend thoroughly. Taste and adjust seasonings. Chill until ready to serve. To Prepare the Salmon: Preheat oven to 425 degrees. Cut the salmon into 2 equal fillets. 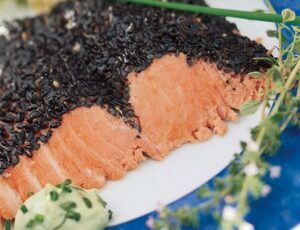 Season with salt and pepper and press the sesame seeds into 1 side of each filet to form a crust. Place the fillets in a buttered baking pan and add approximately 1 cup of the vegatable stock. The stock should just cover the bottom of the pan to a depth of 1/4 so as not to rinse away the sesame seeds. Bring to a boil on top of the stove and place in the pre-heated oven for approximately 7 minutes or until the fish is just cooked through. Remove from the oven and allow to cool right in the cooking pan. Cover and refrigerate. 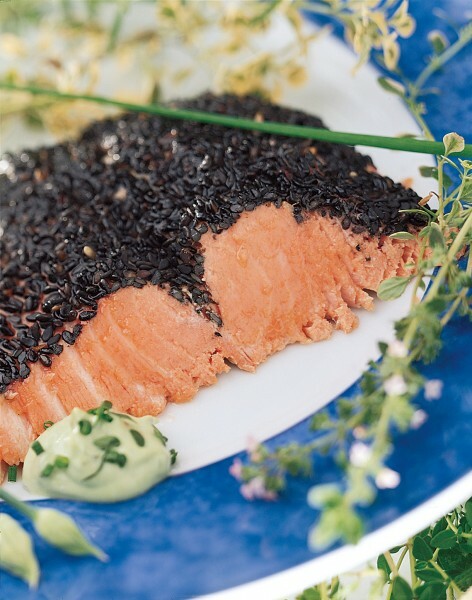 To Serve: Place the cooled salmon on two chilled plates and garnish with the herbed mayonnaise. Serve with a mixed green salad, if desired.